Image: Above image was edited from Bird, 2009 to emphasize the African-Arabian Tectonic Setting and the divided boundary. Edits were performed by the author of this article. 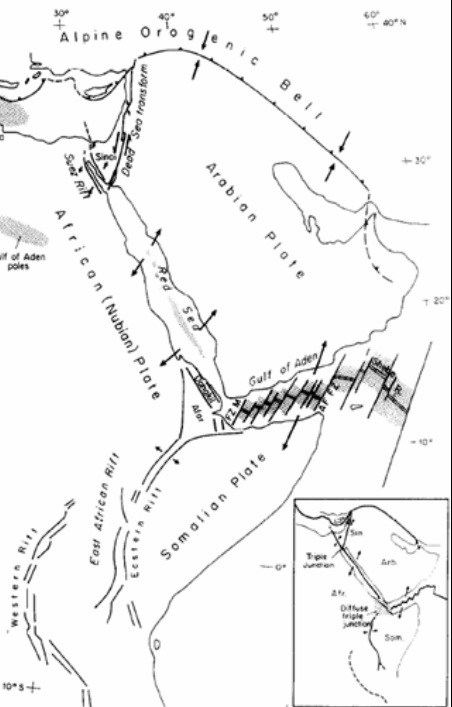 The South Eastern Nubian Plate is bounded to the North-East by the Sinai sub-plate and associated divergent plate boundary; the Suez Rift, the Arabian plate and the Red Sea divergent boundary (Joffe and Garfunkel, 1987). Further south is the Afar Triangle; the triple junction between the Nubian Plate, Arabian Plate, and Somalian Plate. 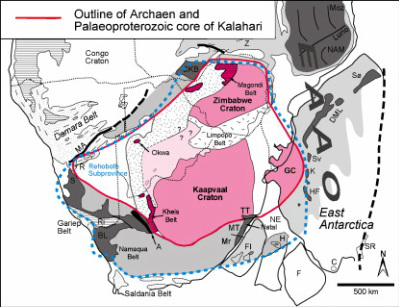 The Danakil microplate is found within the Afar Triangle (Eagles, Gloaguen, and Ebinger, 2002). 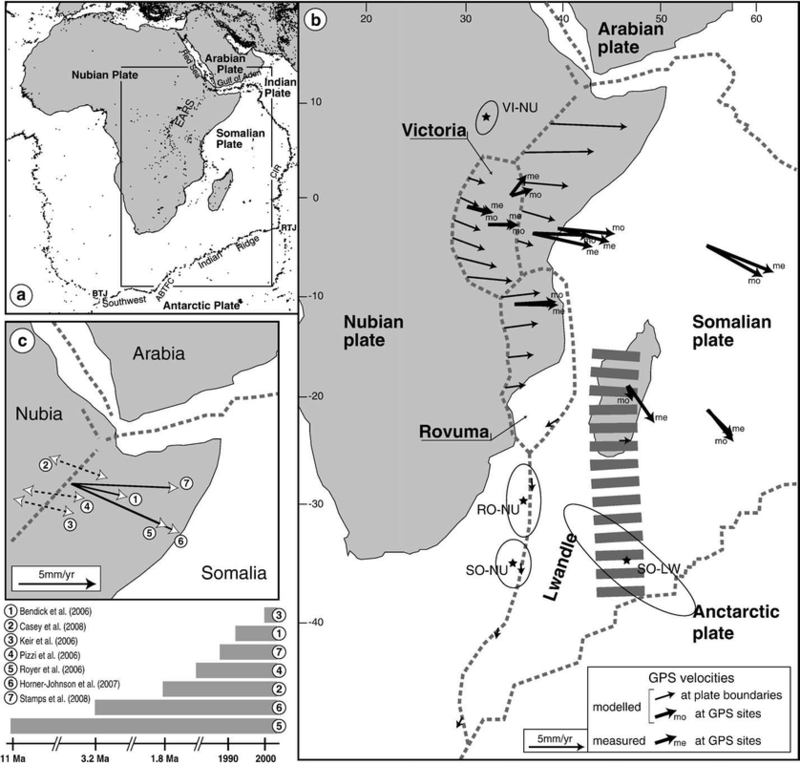 The contact between the Nubian plate and the Somalian plate continues further south along the East branch of the East African Rift system (Joffe and Garfunkel 1987). 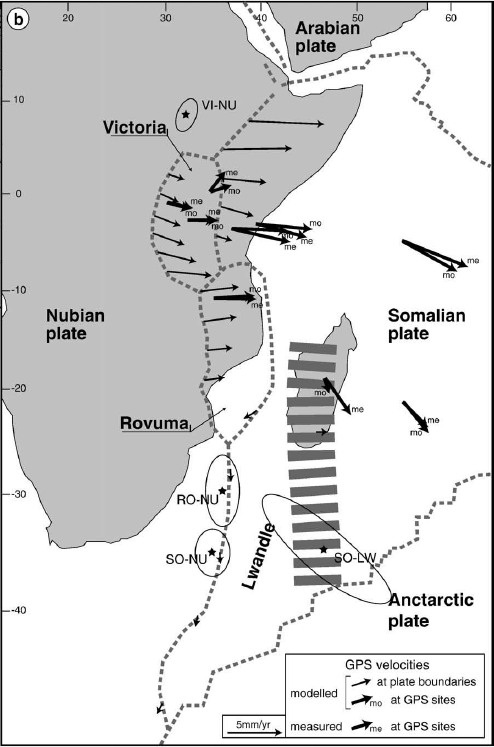 The divergent boundary between the Nubian plate and Somalian plate has three recognized microplates in-between; Victoria, Rovuma, and Lwandle plate (Corti, 2009). The boundaries of the first two are well defined; however the Lwandle plate has only been detected via space geodesy (Corti, 2009). 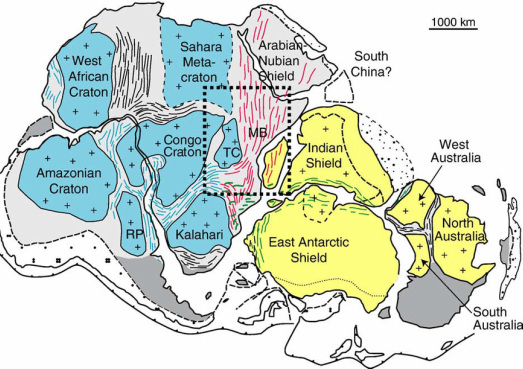 The Nubian and Somalian plates never contact again, as the Lwandle plate and the Nubian plate make a final triple junction in this rifting system with the Antarctic plate (Corti et. Al, 2007). The Nubian-Antarctic boundary extends into the Southern Atlantic Ocean to the Mid Atlantic Ridge, which is composed of a series of divergent and transform boundaries in small succession and these boundaries continue across a final triple junction with the South American Plate and then Northward up the Atlantic Ocean into the North-Western Region of the Nubian Plate interactions. 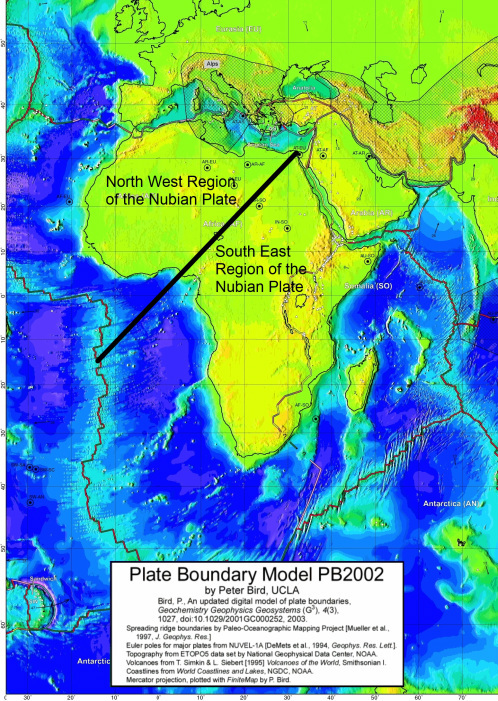 The South East region of the Nubian plate is dominated by divergent plate boundaries. The divergent regimes of this region date back to the break up of super continent Gondwana and its formation at the end of the previous Wilson Cycle; Giacomo Corti (2009) relates the modern orientation of the East African Rift system as a re-activation of basement structures initially formed during the East African Orogen, when the Indian and Antarctic Shields collided with the Arabian-Nubian shield to form Gondwana. The modern form of Africa was formed when Gondwana split from Pangaea 200 Ma, (Dietz and Holden, 1970), and when Gondwana broke upart 185 Ma, creating the Indian Ocean and Atlantic Ocean (Hawkesworth, et. Al, 1999). 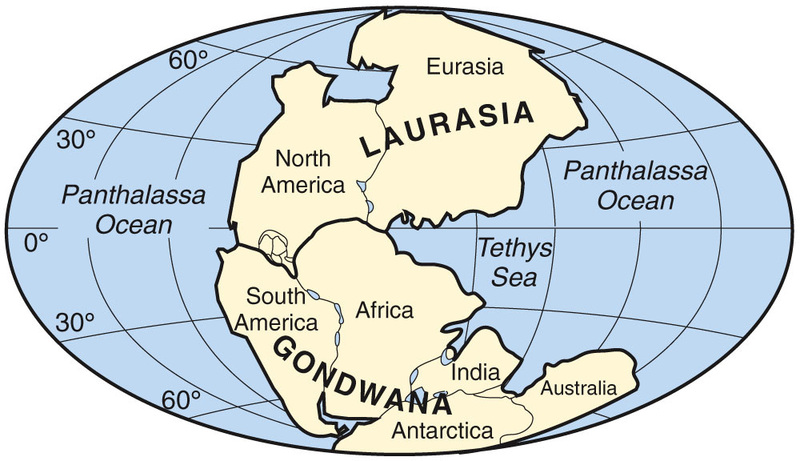 Image: Break up of Gondwana. (Break up animation provided by Greg Houseman, Institute of Geophysics and Tectonics). Media Effects were performed by the author of this article. The motions that began with the break up of Pangaea and Gondwana are still directly measurable. There are numerous means of studying plate motion, each with their respective pros and cons, however GPS data provide an unprecedented accuracy of real time motions, and the ability to track continental deformation and is presented below. Shown to the left are the GPS recorded motions relative to the GPS ITRF2000 (International Terrestrial Reference Frame, year 2000). 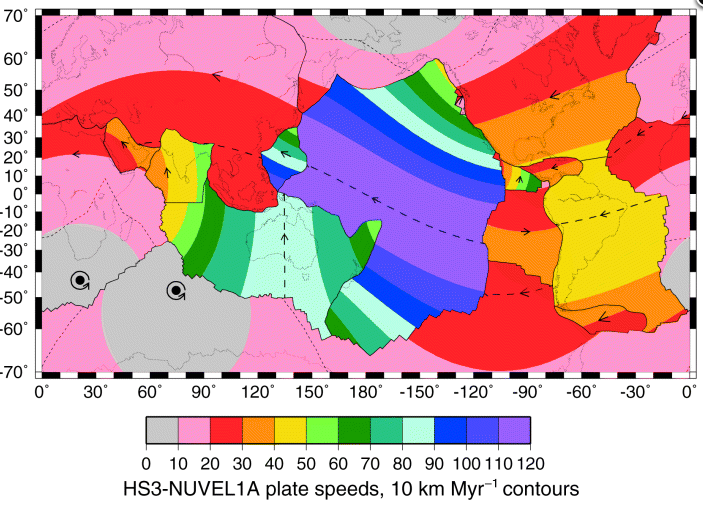 The Nubian Plate is dominantly travelling north-eastward, with residual deformation flexing the Ivory Coast towards South America. (E. Calais, C. DeMets, and J.M. Nocquet, 2003). Image: Rotation Poles of Red Sea and Gulf of Aden (Black Circle) and Southwest Indian Ridge (Black Square). Grey Ovaloids represent 95% confidence areas, the star is the combined Euler rotation pole (Dezhi Chu and Richard G. Gordon, 1998). There are two primary cratons present within the South Eastern Region of the Nubian Plate, the Congo Craton and the Kalahari Craton. All the sub-cratons have ages ranging from 3.6 Ga to 2.0 Ga (Waele, Johnson, and Pisarevsky, 2009), (Goodwin, 1996), and are composed primarily of orthogneises and granitoids. Additional petrologies include greenstone belts and fragments, volcaniclastics, and fluvial sediments (Waele, Johnson, and Pisarevsky, 2009), (Schoene, et. Al, 2008). Video clips, music, and animation suite are all products and property of respective owners. Only digital effects were done by author of this article. Alan M Goodwin. 1996. Principles of Precambrian Geology. [London, Uk. California, USA]. Academic Press. Pages 102-103. Alice E. Gripp and Richard G. Gordon, 2002. Young tracks of hotspots and currant plate velocities. [Eugene, Houston, USA]. Geophysical Journal International. Vol 150, Issue 2, Pages 321-361. B. De Waele, S.P. Johnson, S.A. Pisarevsky. 2008. 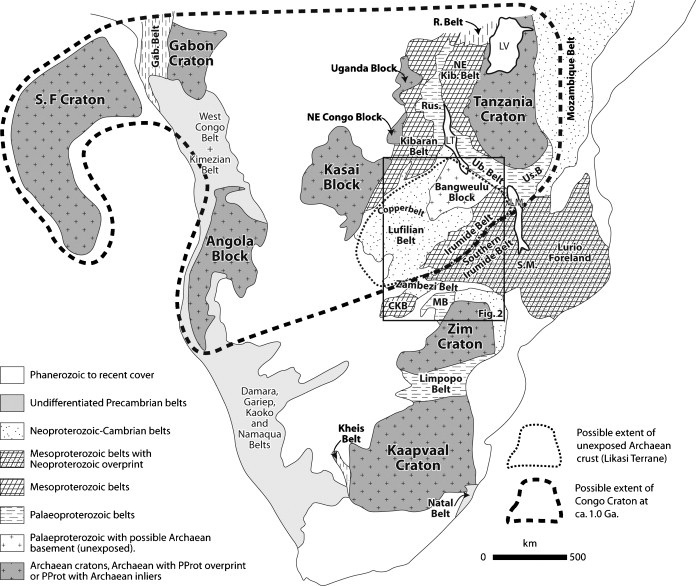 Palaeoproterozoic to Neoproterozoic growth and evolution of the eastern Congo Craton: It’s role in the Rodinia Puzzle. [Crawley, Australia. Yokosuko, Japan]. Precambrian Research. Vol 160, Issues 1-2. Pages 127-141. Benjamin C. Horner-Johnson, Richard G. Gordon, and Donald F. Argus. 2007. Plate kinematic evidence for the existence of a distinct plate between the Nubian and Somalian plates along the Southwest Indian Ridge. Journal of Geophysical Research: Solid Earth. Vol 112, Issue B5. Chris Hawkesworth, Simon Kelley, Simon Turner, Anton Le Roex, and Bryan Storey. 1999. Mantle processes during Gondwana break-up and dispersal. Journal of African Sciences. Vol 28, Issue 1, Pages 239-261. Dezhi Chu and Richard G. Gordon. 1998. Evidence for motion between Nubia and Somalia along the Southwest Indian ridge. [Houston, USA]. Letters to Nature. Vol 298, Pages 64-67. E. Calais, C DeMets, and J.M. Nocquet. 2003. Evidence for a post - 3.16-Ma change in Nubia-Eurasia-North America plate motions?. [Lafayette, Madison, Oxford, USA]. Earth and Planetary Science Letters. Vol 216, Issue 1-2, Pages 81-92. K. Burke, J.T. Wilson. 1972. Is the African Plate Stationary?. [Clarkson, Canada]. Letters to Nature. Vol 239, Pages 387-389. Giacomo Corti. 2009. Continental rift evolution: From rift initiation to incipient break-up in the Main Ethiopian Rift, East Africa. [Firenze, Italy]. Elsevier Earth-Science Reviews.Vol 96, Issues 1-2, Pages 1-53. Graeme Eagles, Richard Gloaguen, and Cynthia Ebinger. 2002. Kinematics of the Danakil microplate. [Egham, England]. Earth and Planetary Science Letters. Vol 203, Pages 607-620. J. Gore, D.E. James, T.G. Zengeni, and O. Gwavana. 2009. Crustal Structure of the Zimbabwe Craton and the Limpopo Belt of Southern Africa: New constraints from seismis data and implications for its evolution. [Vienna, Austria. Washington DC, USA. Harare, Zimbabwe]. South African Journal of Geology. Vol 112, Pages 213-228. J. Jacobs, S. Pisarevsky, R.J. Thomas, T. Becker. 2008. The Kalahari Craton during the assembly and dispersal of Rodinia. [Bergen, Norway. Crawley, Australia. Edinburgh, Uk. Nottingham, UK. Orleans, France]. Precambrian Research. Vol 160, Issues 1-2. Pages 142-158. Peter Bird. 2003. An updated digital model of plate boundaries. [Los Angeles, California, USA]. Geochemistry, Geophysics, Geosystems; AGU and the Geochemical Society. Vol 4, Pages 1-52. R. Black and J.P. Liegeois. 1993. 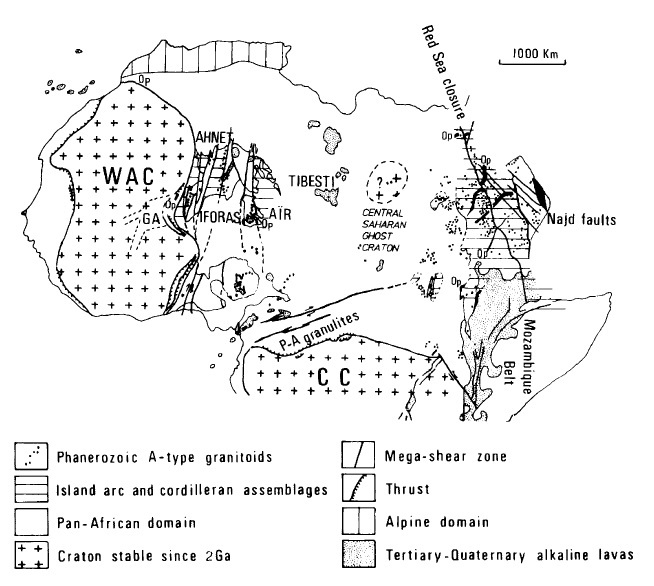 Cratons, mobile belts, alkaline rocks and continental lithospheric mantle: the Pan-African testimony. [London, England]. Journal of the Geological Society. Vol 150, Pages 89-98. Robert S. Dietz, John C. Holden. 1970. The Breakup of Pangaea. Scientific American Inc. Vol 223, Issue 4. Pages 30-41. Sam Joffe and Zvi Garfunkel. 1987. Plate Kinematics of the circum Red Sea – a re-evaluation. [Jerusalem, Israel]. Tectonophysics, Elsevier Science Publishers B.V. Vol 141, Issues 1-3. Pages 5-22.